Hey folks – Here we go again. We’ve got some really cool new pictures for you to take a gander at. If you like classic cars, then these pictures are for you. We’re partial to the old Ford pickup ourselves. These pictures were submitted by a customer by the name of Stan Misraji out of Burbank, CA. He ordered a Bend Pak HD9STX four post lift. This model is a 9,000 lb. capacity auto lift that features an extra 1 foot of lifting height, along with an extra 2 feet of runway length. These dimensions can be important when you want to park a taller vehicle underneath, as show in the image with the Ford truck underneath. It can also be important for you if you need to park a longer vehicle up top. He won a Clore Automotive JNC4000 Jump N Carry jump starter just for simply submitting these pictures to us. Not a bad deal for him. And not a bad deal for you. We will have another drawing next month. We choose a winner randomly from among the many customers who submit images of their recently purchased car lifts. That’s all you have to do. Purchase a lift, send us a picture or two, along with your order number, and then wait to see if you win. A winner has been announced for our drawing for the December jump starter contest. The winner is Steve Smith out of Manchester, MD. He purchased a BendPak HD-7P four post lift. This is a specially engineered lift. It is designed to provide extra lifting height, but not the extra length that typically comes along with it. Normal four post lift engineering requires an extra two feet of runway length for every one foot of lifting height. Sometimes customers want the extra lifting height, but not the extra length that comes with it. That’s where the HD7P lift comes in. It has become a popular recent addition to the BendPak line-up of 4 post lifts. BendPak isn’t the kind of company that rests on their laurels. That would be easy to do, given their position in the market and their wide variety of car lifts. They are always on the front line creating new, innovative and highly useful products. 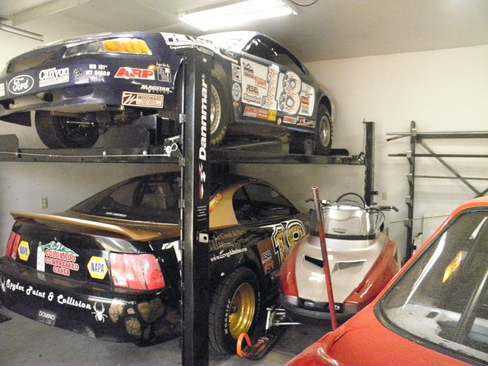 Steve said, “I have attached a picture of the lift with one of my cars on it. I am sure I will love it!! I am sure that I will do more business with you. Thanks again for all of your help”. Check out his very cool picture below. Very nice garage Steve. We told you in a previous post about am on-going contest we are having each month. Basically, we will give away a free prize to customers who have purchased a lift and submitted a picture or two of that lift. This month, the prize is a BoosterPac ES5000 jump starter. This is one of our most popular products, valued at $159. This unit offers a powerful 1700 peak amps and is a handy, durable and reliable unit that has been getting the job done for our loyal customers for over 15 years. The winner is Scott Gouza out of Fredonia, WI, who submitted some really cool pics of his BendPak Four Post Lift. He purchased the HD9XW lift to store his vehicles in his garage. “Thanks for the great service. I have been planning on building a new garage/shop for the past 10+ years. This past spring it became reality. Needing a lift because of having 1967 Chevelle and 1996 Fatboy myself, didn’t justify it. But with my girlfriend owning the 1967 Cougar, 1991 Firebird convertible and 2005 Sportster it made it an easy decision. When I drew up the plans for the garage, it was based on fitting the HD9XW. The lift for us, will provide extra room for storage and the ease of working on our classics”. “Here are some pictures of the lift installed and in use, constructed, moved and I’ve placed the lift in use. It took me and my sons about 5 hours to construct. Contact us today and we’ll fit you into a lift that’s right for you. The folks at BendPak never rest on their laurels. They are constantly improving their products. Always innovating. Always redesigning. Always coming out with new and better products. So when they recently came out with the new HDS series of four post lift, we thought, how could they improve on their old HD models? They already had some of the best features like extra heavy duty 1/2 inch aircraft cables, direct pull hydraulic cylinders that work under a much lower pressure, and a single push button pnuenmatic safety release mechanism. So we thought, if it ain’t broke, don’t fix it. They didn’t reinvent the wheel here. Just a very smart improvement designed to increase the longevity of the lifts working parts. So what new features are on the new BendPak four post lift? A modest little change that helps you save money over the life of the lift. They made the pulleys twice the diameter. Having these oversized pulleys means your cables will now last twice as long. It’s a smart idea that means less headaches for you in the long run. And as always, these lifts are ALI Certified, so you know it’s top quality and meets all the minimum safety standards. Now here is where the savings come in – We still have a few of the old HD series lifts available. And you can get in on one of these at a substantial discount. For a limited time, you can get the HD-14 lift for only $3136 and the extra long HD-14X for only $3696. As always, shipping is free. But don’t wait too long. There is a very limited supply and once these are gone, they’re gone. The title of this post says it all. Choosing an Automotive Lift just got easier. 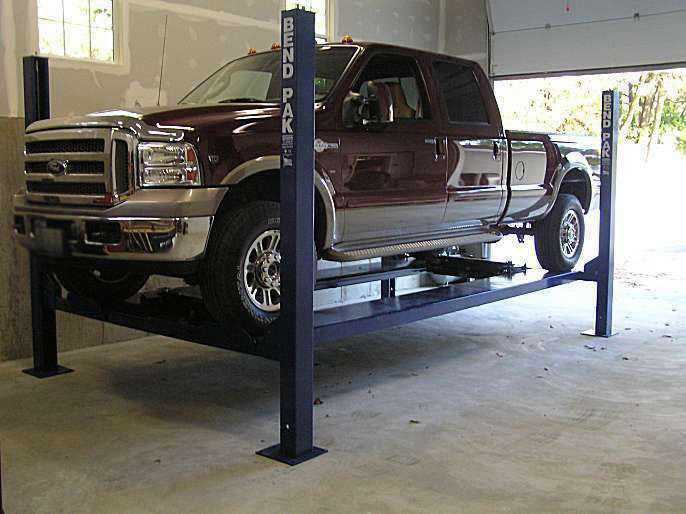 If you click on that link embedded in the previous phrase “Automotive Lift” you’ll find a captivating article about the facts to use to choose between a two post lift or a four post lift. The article appears on the Squidoo network, which is a well known network of articles that are placed by all kinds of different authors about a myriad of different subject categories. The automotive lift article we placed there is appropriately placed in the Automotive category. It goes into great detail about the many considerations required for making the proper choice on your lift. It is a must read for anybody on the market for an Automotive Lift. Take a look at it, and give us your feedback. 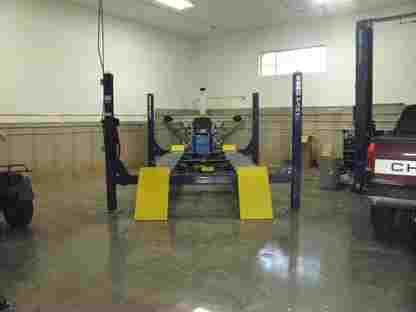 Here is yet another in a long line of happy ASE customers who felt compelled to share their experience with others by submitting some pictures of their new car lift along with a testimonial. You can’t blame them for wanting to show off a little. We all wish we could have a large garage with ample floor space and ceiling height to allow us to place a four post lift to store one vehicle over another. He purchased a BendPak HD9XW Four Post Lift. This is a 9,000 lb. capacity lift that is extra wide, extra high lifting and extra long, giving him the greatest versatility. “I recommended you to a few of my buddies – you should throw me a commission. Anyway started Saturday morning putting the lift together and by Saturday evening the lift was in operation. I pretty much did it myself and the help of an engine hoist. Everything fit together perfect with no problems. I mounted the power unit on the front of the post…. seems to be working just fine. It seemingly took longer to get the stuff at Home Depot to wire in my 230V outlet and dump 3 gallons of Dextron 3 into that tiny hole in the reservoir. I got a little touch up painting to do when the weather warms up a bit from some shipping scrapes but all in all a very pleasant experience. My buddies who were not around to help….. (go figure) really like to see me demonstrate the lift and drink my beer after all of the hard work was done… and of course I volunteered to help them if they buy. Thanks to you, I chose the right lift and It sure is heavy duty and appears to be a great value. Here are a couple pics”. This is probably the most common question when customers purchase our BendPak HD-9 Four Post Lift. Should I get a 220 Volt motor, or a 120 volt motor? What’s the difference? Well, to begin with, the price is the same, so don’t worry about price. With price not being a consideration, the next factor to be concerned about is availability of power. What is currently available to you in your garage? If you have typical 120 volt AC household current available to you, then go with it. The 120 v option works just fine for the typical home / hobbyist garage. If it won’t be a huge hassle or expense for you to run a new 220 volt circuit, or if you already have 220v available to you, then go with the 220v motor. First, it is more powerful. Expect it to raise about 20% quicker than the 120v option. Figure on about a 45 second lifting time for the 220v option, and about 55 seconds for the 120v option. The 220v motor will also be more energy efficient, so if you are using it frequently, you will notice that you are saving electricity. But in a typical home / hobby application, you may only raise the car lift once or twice a week. In that situation, the savings in energy, or time is not a factor. In a commercial setting, where you are up and down, all day, every day, then go with the 220 volt option. 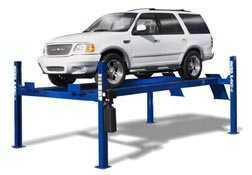 You will save time, energy, and you would expect greater longevity out of the automotive lift. However, In a typical home hobby world, either motor should last you for decades, so don’t fret. These motors on the HD9 BendPak Lifts are not the convertible type of motor, where you can just alter the wiring around inside and change the voltage, so you need to make your decision at the time you place your order. Just give us a call with any questions. You are currently browsing the archives for the Four Post Car Lifts category.